Continuing the legacy in 2008, 59 years after Joy Ridderhof's first visit to the Kalinga Province, the team from GRN Philippines returned. 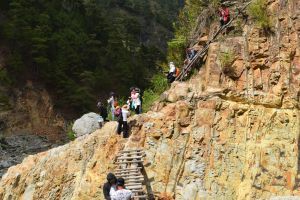 Kalinga Province is called "the place of the head hunters" and is known for its unpredictable weather, hanging bridges, dangerous roads, landslides, rough terrain and steep cliffs. The team travelled there to share Gospel recordings. These recordings are the fruits of research and translation begun many years ago. The mission outreach was called "Kawa-Saka". 'Kawa' - means a big cooking pan used to provide food in festivals. 'Saka' is a local word in the northern Philippines to represent their feet, legs and hands, their tools in farming. The two-word combination represents the team's willingness to do whatever it takes to provide GRN resources for people. Using their hands and feet to tell the story of Jesus in people's heart language. 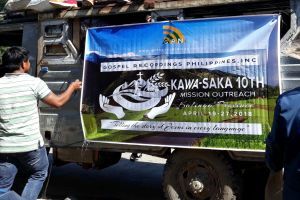 2018 is the 10th anniversary of Kawa-Saka and God's faithfulness to teams distributing recordings to the unreached people in Kalinga. 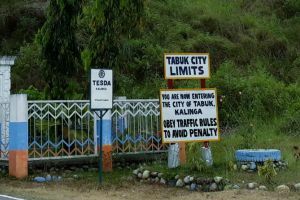 Earlier in 2018, four full time staff, volunteers from three provinces, and other partners from Kalinga Province travelled over 450 kilometres from Manila to distribute the recordings. The difficult terrain meant the trip took almost a full day. With the help of local churches, GRN recordings were distributed to over 100 people at Colayo, Pasil, 80% of whom were children. Over 100 people at Batong Buhay, Pasil, and 200 people at Magnao, Guil'ayon attended morning and evening services. Most are oral communicators, animists, and idol worshippers: holding onto traditions passed down through many generations. It was a privilege for the team to be able to share the Gospel, in a language they could understand, with these people and others who came from surrounding villages. The team also distributed GRN materials to churches who will use these resources to reach other people groups. 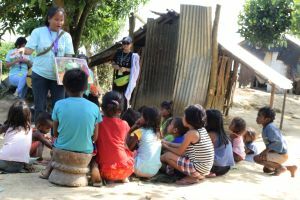 Ilocano Bibles from the Philippines Bible Society were provided for those people who could read. Generous sponsors provided food, clothing, toys, groceries, school supplies, hygiene items and basic construction materials to build toilets. One church sponsored a feeding program, providing a cook and volunteers for the three communities. We praise God that He feeds not only the soul but also the body.